ASTRO (American Society for Therapeutic Radiology and Oncology), ASCO (American Society of Clinical Oncology), ACRO (American College of Radiation Oncology), ACR (American College of Radiology), ABS (American Brachytherapy Society), RSNA (Radiological Society of North America). 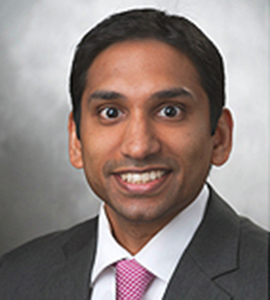 Dr. Varadhi’s interests include central nervous system, lung, breast, and pediatric malignancies as well as the use of radiosurgery. Dr. Varadhi believes that a cancer diagnosis can be difficult for not only the patient, but also their family. His goals are to educate the patient and their family and to give them a sense of control over their diagnosis and their treatment. He not only wants to treat the patient, but he also wants them to feel as best as possible. Dr. Varadhi is optimistic and realistic with his patients and strives to help them through what can be a difficult time.